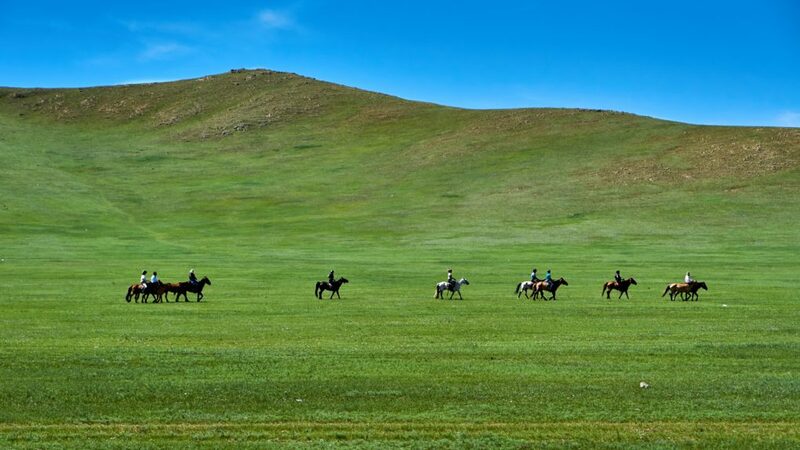 Join us for a fantastic journey on horseback to watch the famous cross-country horse racing at Mongolia’s national games. The Naadam festival is the quintessential Mongolian experience. The atmosphere at the festival ground is exciting, especially when the horses arrive to the finish line. At this time of year the whole country is on holiday for this national pride celebration. The trek is composed of 2 days horse riding, 2 days at the festival, and 1 celebration and relaxation day back at our base camp. Naadam includes three traditional sports: horse racing, wrestling, and archery. Wrestling and archery competitions are held in the Ulaanbaatar stadium in the city, while the horse racing is located in the countryside. We will see the horse racing up close and have a private demonstration of wrestling and archery at our site. 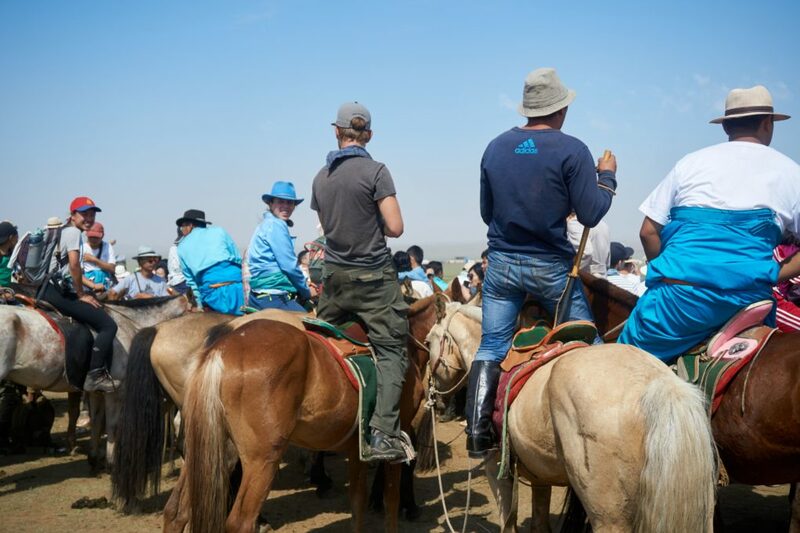 The area around the horse racing site will be covered with camps of Mongolian horse trainers and young jockeys and you will join in the celebrations from horseback as Mongolians have done for centuries. Arrive at Stepperiders’ base camp where you will meet the other trek participants over dinner. You will have a briefing on the trek ahead. It is very important that you arrive on the 8th of July (or earlier). The trek will start after breakfast to ride to the horse racing grounds. We will head off in the direction of Ulziit, a small horse trainers’ town. We will have lunch in the shade next to a beautiful river, with view of the plains and surrounding mountains. After riding through Ulziit we will get settled for the night. You will sleep in a traditional Mongolian ger. Ride to the racing grounds to see the children and the horses reach the finish line in a final sprint. In addition to watching the races, you’ll be able to ride around the fairgrounds and soak up the atmosphere, eat food, play billiards, shop for souvenirs, and meet Mongolians enjoying their national holiday. You will sleep in a traditional Mongolian ger. 11th July: Nadaam Opening Ceremony day. We will drive to UB in the morning to assist to the Opening Ceremony. Then you will be able so see the Mongolian wrestling and archery competitions. You can also walk around the stadium to have some food, find souvenir and enjoy the festive atmosphere. At the end of the afternoon we will drive you back to our camp close to the horse races. Wrestlers wear special clothes to show the beauty and strength of their bodies. There is no categorization according to weight. The basic rule of wrestling is the number of wrestlers must be equal: 512 or as many as 1024 during special anniversaries. The higher-ranked wrestlers choose their competitors from lower ranking wrestlers. The winner remains for the next round whilst the loser leaves the competition. If you don’t want to watch sports all the time, there’s plenty to see and do outside – go for a walk in the streets and enjoy some food, music, crafts or just watching people and culture. This is the best time to see the Mongolian people and soak up with the party atmosphere! You will sleep in a traditional Mongolian ger. We will have a last stop at the horse race finish line to see the end of the most popular race. Afterwards we will ride along the river towards the small town of Songino where we’ll stop for lunch. We will then cross over the river and ride back to Stepperiders. Once at camp there will be time to relax, take a shower, get changed, maybe play some volleyball before dinner is served in our communal dining ger. If there is time, you can take your horse up to the ridge to have a look around. Sometime in the morning, our dinner arrives on four hooves and is dispatched into the cooking pot. The Mongolian method of slaughtering and butchering an animal is humane and fascinating, but not for the squeamish. We will prepare a feast for you while you relax. The meal is called “khorkhog,” (sounds like “hor-hog”) and it is traditional Mongolian goat, pressure-cooked with clean, hot river rocks, potatoes and carrots. While you’re waiting for your food, you will watch traditional Mongolian wrestling. You can even have a try if you feel adventurous. Plus, our extended family will join us for the feast, so you will have plenty of opportunities to make new friends and practice your Mongolian! 14th July: You’ll be taken back to Ulaanbaatar in the morning. Longer stays are most welcome. Cost: US $850 per person. Deposit: We require a $170 nonrefundable deposit to confirm your reservation. Price includes: All accommodation, horses, guides, support van, cook, 2 days of Naadam horse races, wrestling/racing/archery demonstration at our site, special cookout with traditional “khorhog”, and 3 meals per day. Pickups and drop off are also included. We can pick you up in the city center, or at the airport or train station. Experience with horses and outdoor experience strongly recommended. There are several long days of riding. You need to be comfortable managing your horse independently (leading your horse on foot, riding through crowds, finding your way from the festival grounds to the camp site). Arrival Time: It is required that you arrive at our camp on the 8th of July or earlier. Our orientation is held at dinnertime the evening of July 8th. Late arrivals will not be accommodated. Please make your travel plans keeping this in mind. If possible, schedule your arrival for the 6th or 7th. That way, you will also have a chance at recovering from jet lag before getting on your horse on the 9th. Riding Experience: Experience with horses helps, but beginners are very welcome. During the trek we will have a beginner group with several horsemen to help you. We have had total beginners on the Naadam trek, and they had wonderful time. We will provide beginners with safety helmets.